TOPS. if you can think it. we can print it. Hotel telephone faceplates and commercial printing solutions. If you can think it, TOPS can print it! 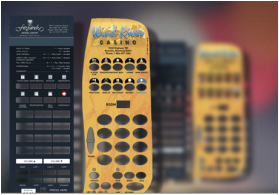 Our talented staff of designers and production professionals have over 25 years experience in printing hotel telephone faceplates and hotel room printing solutions, and we're here to help you bring your ideas to life in print. We appreciate the opportunity to work with you on your next printing project. Call us at 1.888.491.8300, +1.719.633.9388, or write sales@topstops.net. TOPS custom full color paper faceplates provide a colorful accent in the room and support existing or emerging brand standards. Whether you need signage, rate cards, labels, flyers, or a full color product brochure, the TOPS team can help you design and print. Choose from a variety of standard and custom ATM signage designed to communicate "Service, please call" messages. Choose our high-quality .020 aluminum labels with baked on finish, and top rated 468 3M adhesive, one the the strongest available. 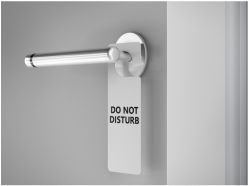 Need to dress up your do not disturb signs, or have a guest breakfast menu door hanger for your guest? Choose TOPS custom crystal plastic faceplates to complement the look of contemporary room appliances. 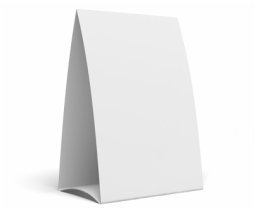 Choose TOPS A stands, or L stands in plastic or paper for all of your front desk, lobby, guest room, and common area requirements. TOPS hotel telephone rate cards help keep your guests fully informed of guest room telephone local, long distance, and international call rates. 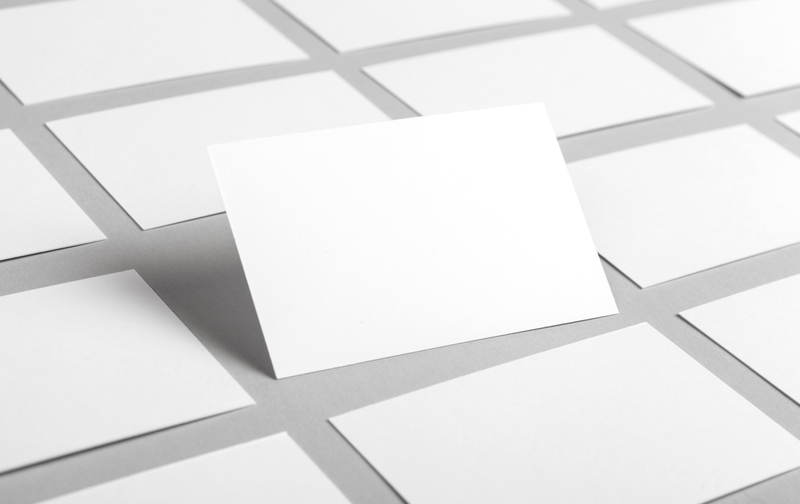 Whether you need new business cards, or reprints of existing ones, we can design and print in cost-effective manner. 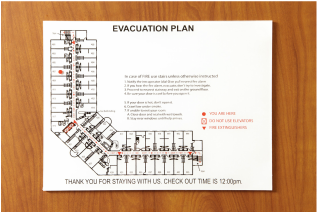 Are your hotel evacuation signs up to date and in good shape? If not, give TOPS a call and let us put it together for you. Clear matte plastic faceplate overlays help protect your faceplate investment and facilitate cleaning and maintenance. TOPS payphone signage solutions help payphone providers communicate important rate information to customers worldwide. Adhesive-backed, coated TV remote, telephone handset, door hanger, towel hanger, and water bottle danglers in a variety of sizes and colors. Durable plastic Water|Air signs are available in Blue and Red to help communicate important natural resource information and locations. Don’t leave that money on the table! Whether it is $2 a bottle or $5 a bottle, let your guest know with TOPS water bottle danglers. Our sturdy crystal plastic name tags/badges are available in a variety of sizes with either magnetic or pin fasteners.